Hi. I hope that my abundance of field-work related pictures does not lead you to believe this is all I do. The vast majority of my time is spent in the lab or on the computer analyzing samples and data, and making figures and writing. These are all very exciting things to do. None-the-less, I am sharing more field work pictures because they are prettier. Two field projects I helped with this spring involved sediment coring in Rhode Island. 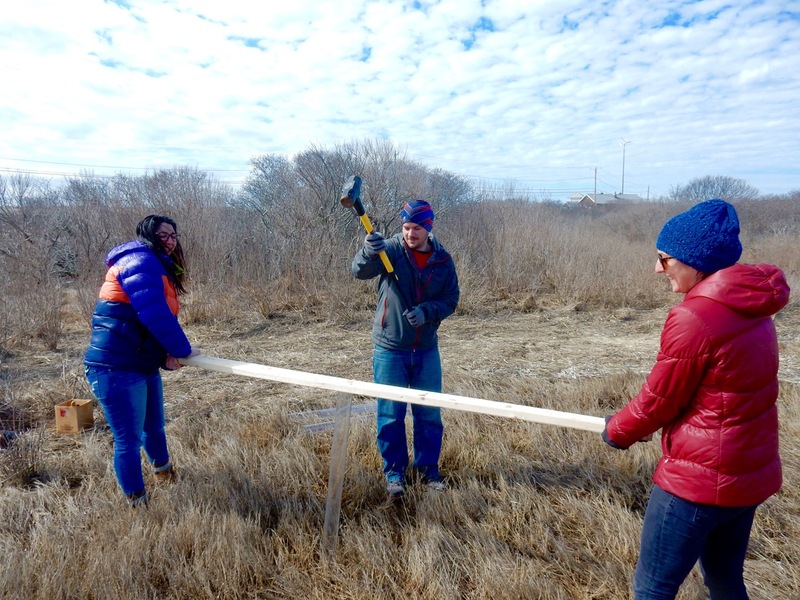 The first project was to help Stephanie Spera collect sediment cores from Succotash Salt Marsh. Stephanie is a 5th-year graduate student in my department and she is teaching a Climate Change course at Wheaton College this semester. For this class, Stephanie wanted her students to gain firsthand experience with the idea of paleoclimatology. For a full description of the Succotash sediment cores, see my previous blog posts or “7oo yr sedimentary record of intense hurricane landfalls in southern New England” by Donnelly et al. (2001). In brief, sand layers in the sediment core represent local landfalls of past hurricanes, and so we can reconstruct the history of large storms. The second project, also seen in pictures, examines the effects of nitrogen remediation in Narragansett Bay. First-year graduate student Sydney Clark is pursuing this project and plans to use nitrogen isotope in sediment cores to qualitatively assess the effectiveness of adding tertiary treatment to East Providence’s wastewater treatment plant. We collected replicate sediment cores from Swan Point in the Seekonk River, immediately across from the treatment plant and Sydney is now busy in the lab with these sediments. Stephanie caps and cleans the salt marsh core. This core contains three discrete sand layers which were deposited when a hurricane made landfall and pushed the beach sand up into the marsh. Stephanie is teaching her class about past climate change. These salt marsh sediments record the history of hurricane impacts on the area. Stephanie pounds the core tubing into the marsh sediments. Sydney gets a sediment core from the canoe. Brown geology graduate student Sydney Clark holds a sediment core from the Seekonk River. Sydney is investigating Nitrogen pollution in Narragansett Bay, and in particular if the upgrades to the Swan Point wastewater treatment were helpful in reducing nitrogen levels in the bay. Sydney specializes in nitrogen isotopes is studying in the lab of Meredith Hastings. Two sediment cores collected from Swan Point/Bollard’s Point on the Seekonk River.